Benba Motors (Pty) Ltd has taken on the Proton franchise for the following reasons. The brand has great potential. Good long term approach to the South African market. The ability to build up a passionate customer base. Proton vehicles are designed and look slightly different to the conventional car. A great amount of time has gone into the design and look of these vehicles. The Lotus involvements in the R&D is clearly evident. 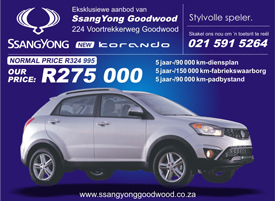 PROTON GOODWOOD's strategy is to carefully build up the brand through a steady increase in sales. To do this we need to give superior sales service and ensure we maintain a top aftersales record through our workshop support. As a main Proton dealer it is also our goal to protect the brand and with this in mind we are eager to ensure that the resale value on Proton's maintain high.